Tonight we welcome back Supergirl to the weekly line up of segments with 'Supergirl Lives' (Season 2, Episode 9). 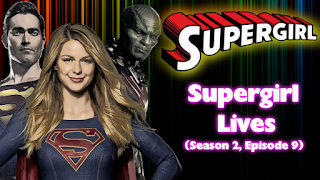 Opening sees Supergirl & Guardian (Olsen) dealing with Jewel Thieves, Winn gets involved and smacked around, Supergirl is annoyed with Guardian's 'help', plus she is bored 'mundane' crimes. Alex and Maggie are hitting it off, they spent the night together and Alex is just glowing. Mon-El now works at the alien dive bar, and it suits him just fine. But he wants to Help Kara out so he takes the day off. Mon-El tells Kara it's smart to not go looking for trouble. A yellow sun gernade is used to give Supergirl her powers a kickstart for a big finish, Joe the hunter also helps by taking out one of the villians and comes ot earth with the rescuees . Episode ends wit Kara reuniting the missing girl with her mother. Kara turns in the story to Snapper, saying she's gonna follow her heart as a reporter. He seems dismissive at first but when she leaves he says 'that a girl' . Alex apologizes to Maggie for going nuts and Maggie figures out that Kara is Supergirl and gives her one more chance. Mon-El brings Supergirl some club soda and admits he was wrong about the whole 'getting involved / being a hero' deal. He says the prince on Daxem wasn't worth admiring, and he made a decision that he wants to be a superhero. Camden Comic Con 2017: Updated Guest List!!! !